never thought I'd see the day but I have got a fast newt, sorry Roger, as an alternative to the 115 doing narrow band. First of all I concede NB is the way to produce detailed images, I have spent the recent winter learning the ropes and produced couple of my best images ever. But however I have found it time consuming and there is a part of me that is impatient and can't see me doing NB during the short summer nights. So I thought a fast newt coupled with the SX25-C would be just the ticket to be able to get set up and grab an image or two in one session. To keep it simple I'm going to try unguided, I'll have to see what I can achieve in terms of sub length but there are some things in favour of unguided, the newt is f3.9, almost 4 times the speed of my frac, the SX25-C has relatively large pixels and with the EQ6-R and a spot on polar alignment. I'll be happy with 2 min subs but can always fire up the Synguider, sorry again Roger. 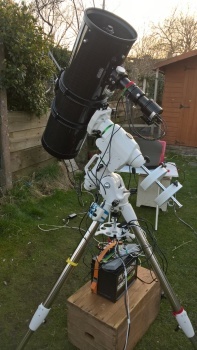 The Opticstar ARX200 f3.9 astrograph.